I know it’s been a couple months since I posted an update on the Smokey House Rehab, but that’s mainly because there’s been nothing to update you about. The rehab has been on the back burner because of all the wedding madness, and we’ve finally gotten back into it. 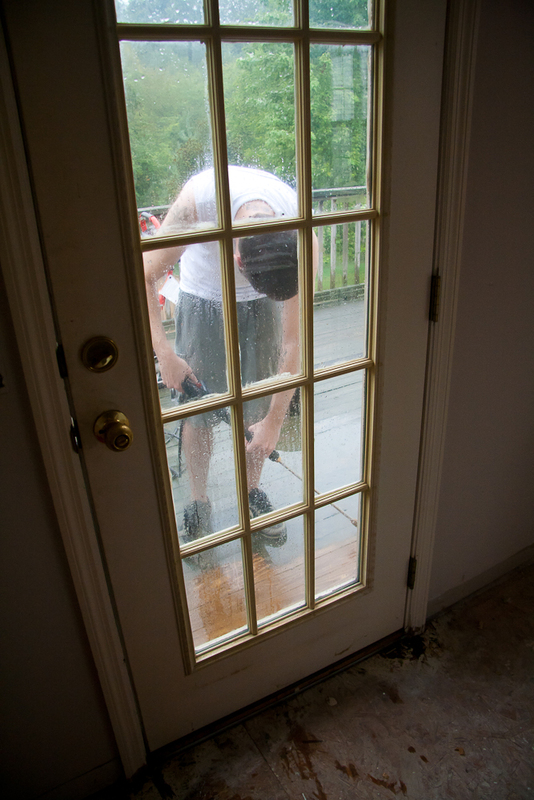 The last time we attempted to fix it up ourselves with no help from professionals, it was 100° outside with no working A/C, which made it about 110° inside the house. We were trying to put up a very heavy light fixture in the house and it wasn’t cooperating, and that pretty much pushed us past our breaking point. We decided that we wanted to hire some help instead of doing it all ourselves, because we were just getting too burnt out. 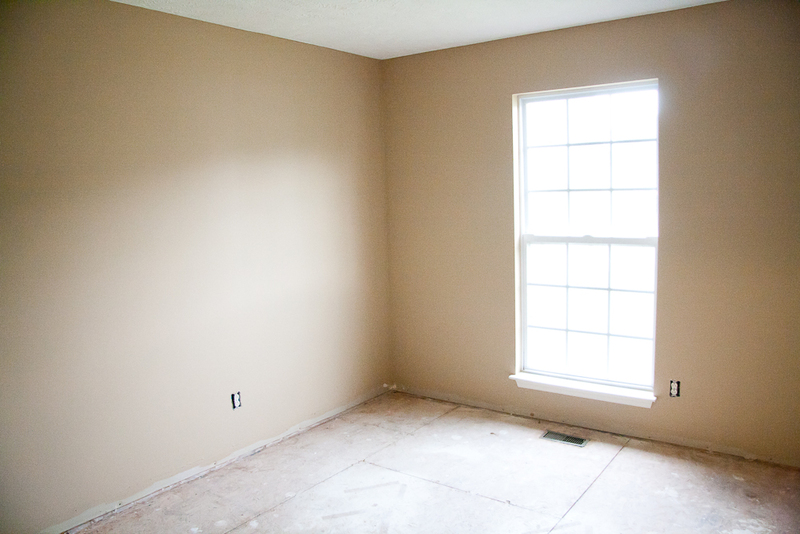 We had several contractors/handy men/painters come and take a look at the house to give us quotes, and then once they left, we never heard back from them. What’s the deal? People don’t want work? 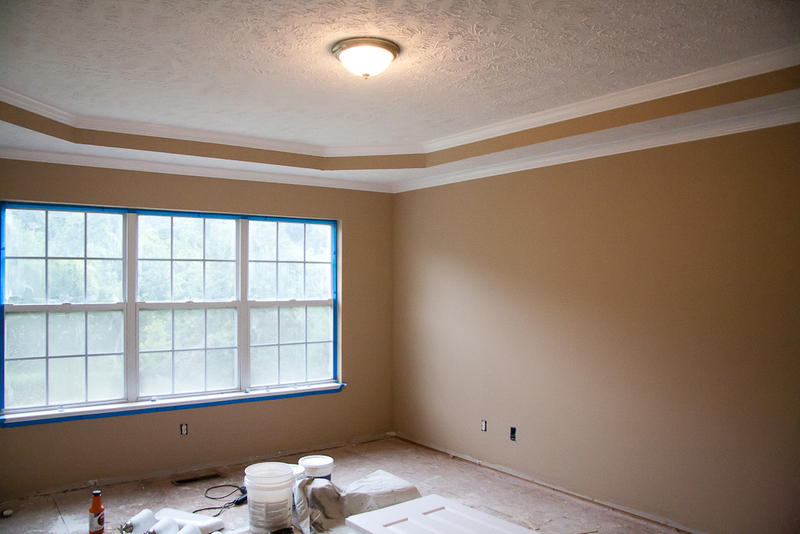 Finally, we found an awesome painter that has been doing an amazing job so far. So far he’s painted all the bedrooms, the hallway, the bonus room, and the stairway going up to the bonus room. We chose Mushroom Bisque as the wall color, and we couldn’t be more happy. It’s a good contrast with the white trim, and it’s a nice tan color without being too peachy, as some tans can be. I spent Sunday afternoon cleaning the kitchen……again. This kitchen is seriously my nemesis, but I think I finally conquered it! Our painter is going to be painting the inside of the cabinets to try to get rid of the smell that is still lingering from the previous tenant who smoked heavily in the house and somehow got this kitchen dirtier than anything I have ever seen. 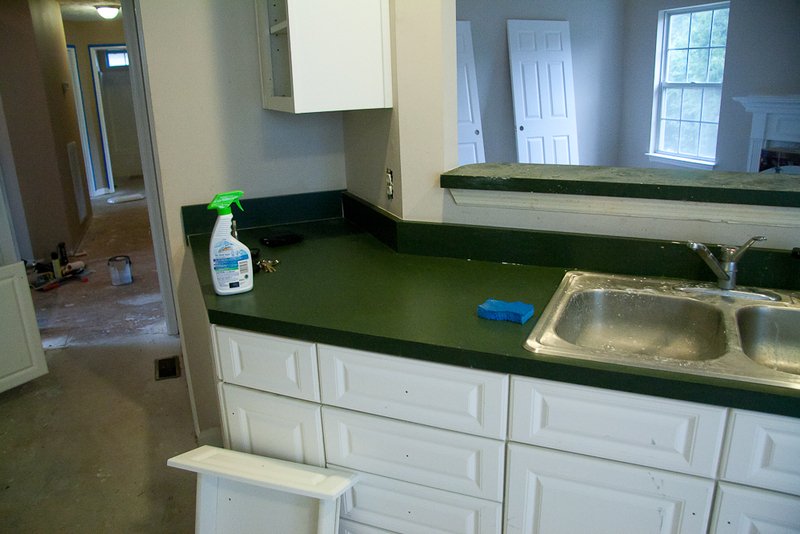 We’re going to be replacing those awful green counter tops and that dirty sink and faucet, as well as installing a pretty, modern, tile floor. It’s gonna look like a brand new kitchen! After I was satisfied with my cleaning job in the kitchen, I got started on the weeds in the front yard. 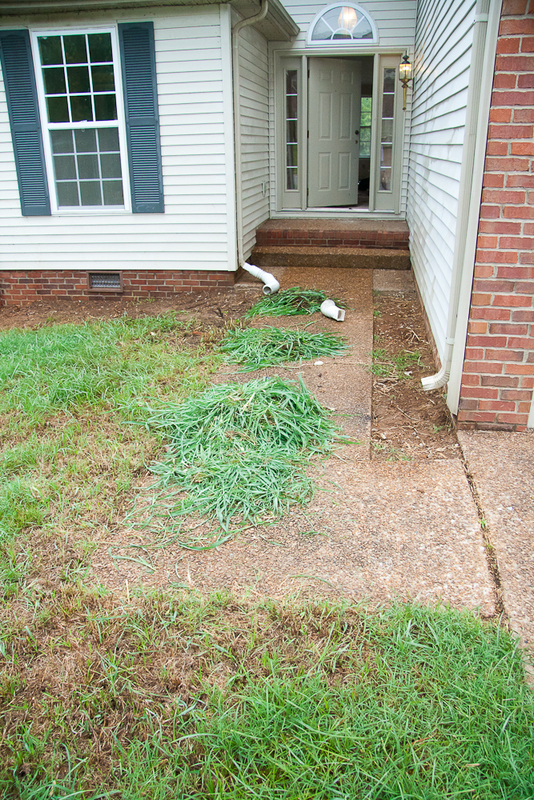 There were certain sections of grass around the walkway that had weeds that grew like they were on steroids. The rest of the grass would be a normal length, and these weeds were 2 feet tall! So I pulled them all out……in the rain. We had a landscape company come out a few weeks ago and completely demo the entire backyard, which was previously covered with thick weeds and vineage (yes that’s a word, even though my spell check doesn’t think so). They removed the tree stumps from those huge cedar trees and dug out all the weeds and about an inch of top soil to get rid of most of the roots. Then they spread seed and covered it with hay so that the seeds would be able to germinate more successfully. Now we have pretty little shoots of grass poking through, and in about a month it’ll be a pretty grassy backyard, instead of the forest it was when we started. Steve spent the day pressure washing the outside of the house and the deck, and what a difference! It’s amazing what some high-pressured water can do! You can actually see the grain of the wood now instead of a thick layer of greenish black algae, or whatever that stuff is. 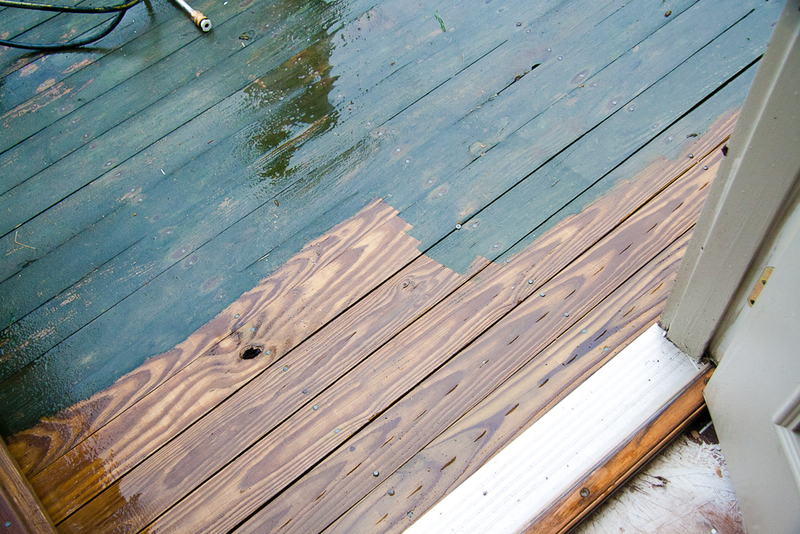 We’ll be sealing the deck once it’s completely clean so that it’ll last for several more years. Oh, I forgot to say how beautiful the paint job looks — awesome! That looks amazing! Where is that house at? It’s in Nashville by the airport. Off Elm Hill Pike.